Well, in arriving at my own conclusion I tended to be a bit practical. I have a wife and we do take some road trips to visit family. We also have house guests from time to time, so we occasionally need to move more than just two people. I’m done with SUVs. We raised two children and they are out of the house. We once had two Labrador retrievers, but now we are dog-less. Although, that could change. And, I prefer to slide down Into the driver’s seat and sit low, rather than climb up. Plus, I do like performance and performance cars. Rapid acceleration and top-notch handling are on my reasons-to-buy list. Lastly, I’m a station wagon fan. We’ve previously owned four different wagons intermixed with various SUVs in our household fleet. Thus, I decided the Mercedes-Benz E-class station wagon would fit the bill and could be the car for me (or us) until the end of time. This opportunity to drive the new 2019 Mercedes-Benz E450 sedan reconfirmed my thinking. I’ve driven the E-class wagon previously and the sedan drives quite the same. 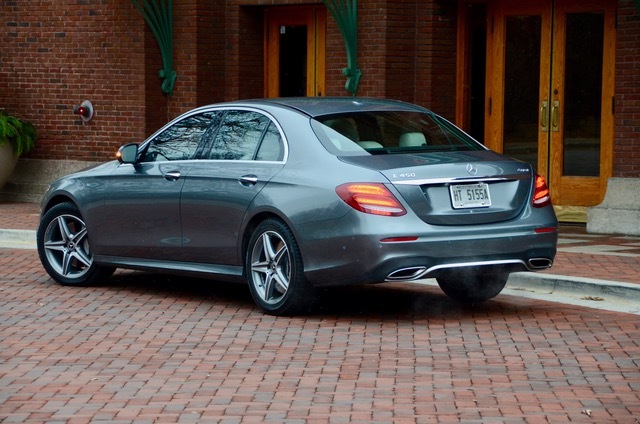 Mercedes offers the E-class in body styles to suit everyone. Along with the sedan and wagon there’s also a coupe and a convertible. The present generation of E-class was introduced in 2016 loaded with numerous technical innovations. Comfort was improved, new infotainment came on the scene along with a new level of intelligent drive. The 2016 model brought a new dimension in driver assistance and safety systems. The 2017 showcased new and more enhancement to these. For 2019, the E-Class family will benefit from these enhanced safety systems and route-based speed adaptation, which uses a substantially broader scope of map and navigation data to more safety navigate different driving roads and situations. The 2019 model brings two new model designations to the E-Class lineup with E 450 and E 450 4MATIC variants. 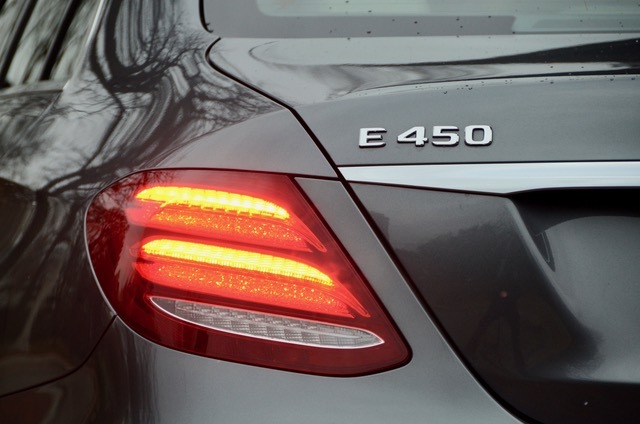 The new E 450 model designation for the E-Class Sedan, Coupe, Cabriolet and Wagon receive a more powerful engine, and replace the previous E 400 models. The E 450 and E 450 4MATIC models are now equipped with an upgraded 362-horsepower 3.0-liter V6 biturbo engine. That’s up 33 hp from last year. Torque is up by15 lb-ft to 369 lb-ft. Mercedes’ 9G-TRONIC 9-speed automatic transmission puts the power to the wheels. EPA test-cycle fuel economy ratings are 20 city mpg and 28 highway mpg. 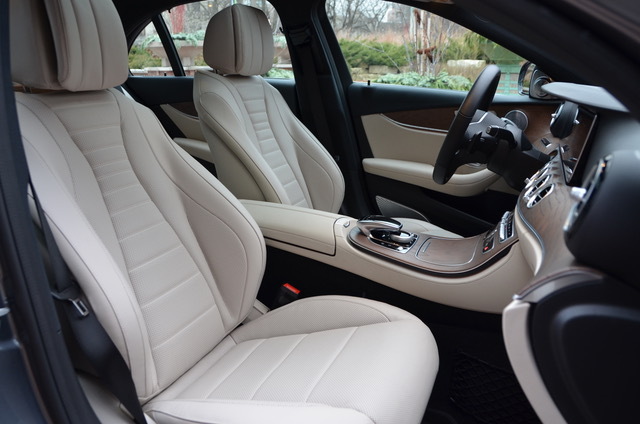 Other changes for 2019 included a new 3-spoke Nappa Leather multifunction steering wheel that allows the driver to operate all safety assistance systems without ever removing their hands from the wheel, two additional wood trim interior options with matching center consoles, and a Rear Safety Package newly available on the E-Class Sedan. 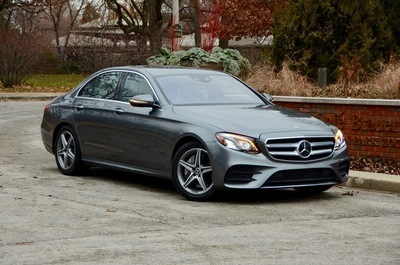 The 2019 E 450 4MATIC sedan went on sale in the U.S. in fall 2018 priced at $59,950 plus a $995 destination and delivery charge. 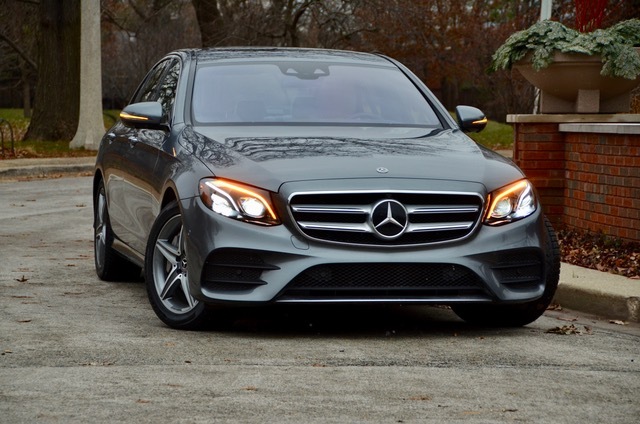 As I am confident you will imagine, the Mercedes E 450 is loaded with all the luxury features you would typically expect to get on a car of this caliber. One of the many “surprise and delight” comfort features that I appreciated was the heated armrests, along with the seats and steering wheel. Early last year I drove the 2018 E 400 coupe. I was looking forward to driving the E 450 sedan with its increased engine output. As you would expect there’s no disappointment or concerns with the drivetrain. It’s very quiet, delivers very impressive acceleration from stop to 60mph in 5.0 seconds…more than the average luxury car driver needs, and will get you where you need to go with complete confidence. The E 450 is exhilarating to drive, whether in be on city streets, along an interstate or carving through some scenic back roads. Mercedes engineers have designed and developed a very well balanced car that can go from the sublime to the aggressive. Steering is precise and can be changed between comfort and the heavier-weighted sport modes. Brake pedal feel is firm delivering quick response to slow the car. Combine all this with a compliant suspension that maintains very composed handling and you have lots of fun and pleasantries at your command. Balancing this is the ability to load the car with four people for an evening on the town in complete comfort. In the cockpit is where the luxury resides. It’s beautifully trimmed and detailed. There’s excellent fit and finish and a high quality feel to all the controls, knobs and buttons. Seat comfort and support is excellent with a wide range of adjustments. Engine, wind and tire noise are well managed and controlled. Even the winter tires, which can be slightly more noisy, that were equipped on my loaner-car could hardly be heard. Mercedes say the E-Class Sedan (and Wagon) are the most advanced vehicles in the Mercedes-Benz product portfolio. The 10th generation sedan is equipped with several world-premiere technologies. Fourteen different systems will help you accelerate, steer, brake, and stop the E 450. Speed will be adjusted by looking ahead on the route for hills or curves and anticipating needed change. It’s the first car to have infrastructure “Car-to-X” communication using cloud-based airwave technology to provide advance information about road and driving conditions. For more information, specification and details on the entire 2019 E Class model range have a look at www.mbusa.com. For the best in comfort, performance or technology in a midsize luxury sedan, the 2018 Mercedes-Benz E-Class should be right at the top of your list. The Most Independent Mercedes-Benz Buyer Research - Anywhere!